Sometimes important evidence can be found very close to home. Previous Posts have shown the epidemic nature of deaths from coronary heart disease (CHD) during the 20th century. The epidemic emerged in the mid-1920s, and this is very clearly recorded in the UK and in the USA. As it occurred simultaneously in all continents of the world (with the exception of the tropics) it can be regarded as a pandemic. The death rate increased rapidly to a peak in about 1970 and it became the major cause of death for several decades in many countries. Following the peak the death rate went underwent a rapid, unexpected, and spontaneous decline. The cause of CHD is not clear. Although there has been a ready acceptance that it has been due to faulty diet, research (usually ignored) has shown that this is not the case. I have suggested that a microbiological cause is the most likely, the only one that fits the evidence and our understanding of medical science. But the incidence of CHD has varied; there are in particular social and geographical variations. These might not tell us directly the cause of the disease, but they might indicate a variation of susceptibility, and this will help us to understand the condition. The sun is related to the incidence of CHD. The sun appears to be protective, and conversely the incidence of death from CHD is highest among people with little exposure to the sun. This is demonstrated in a number of studies. People with CHD have on average lower blood levels of vitamin D than matched controls. The blood level of vitamin D is an index of exposure to the sun. We have seen in previous Posts that the death rates from CHD in the UK are closely linked to latitude. 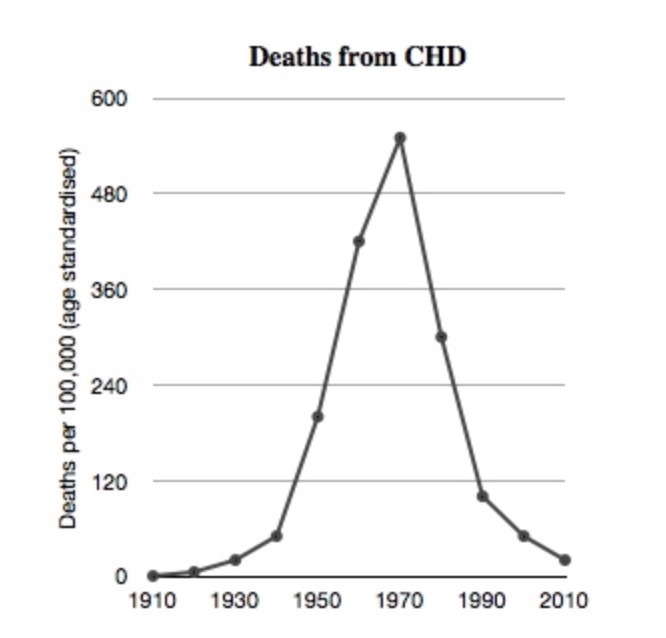 The further north the town of residence, the higher the overall adjusted death rate from CHD. However there is no difference in dietary patterns or any other personal external risk factor. The high death rate of the population of Belfast in Northern Ireland compared to that of Toulouse in France can only be explained by the geographical factor of latitude, the greater exposure of the population of Toulouse to the Sun. 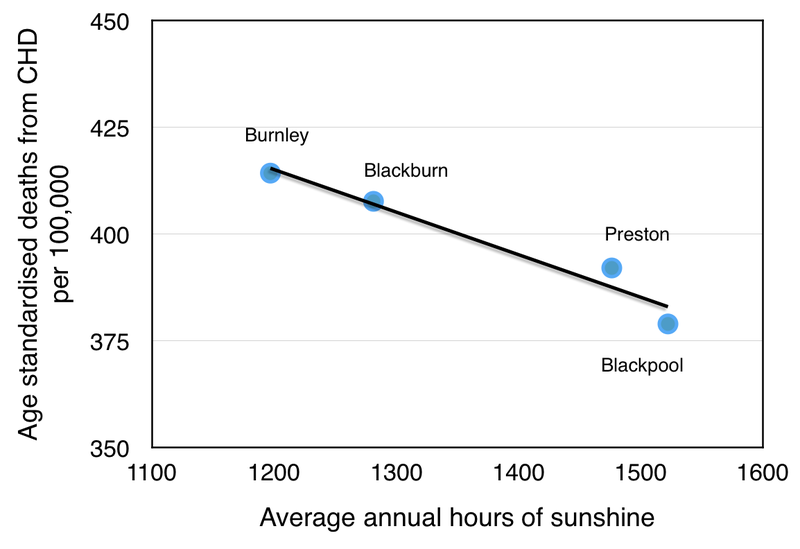 Within East Lancashire, UK, the decreasing death rates from a number of conditions with increasing altitude of residence could only be explained by cleaner air and better sunlight penetration. The same is observed in the USA overall, and in New Mexico in particular. There is more evidence from my place of residence in Lancashire that indicates a protective effect from the sun. 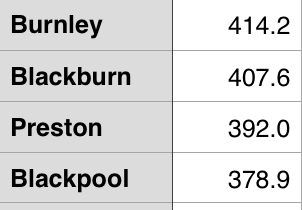 Let us consider four towns in Lancashire, UK : Blackpool, Preston, Blackburn, and Burnley. 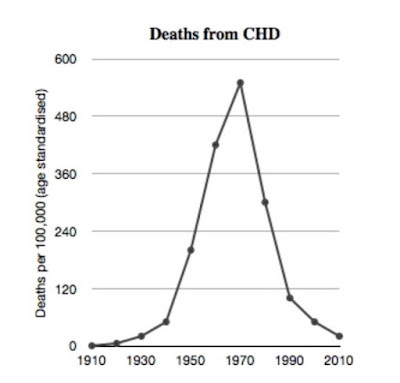 They have had different death rates from coronary heart disease (CHD), and the data shown in Figure 3 are from 1980. The death rates now are very much lower as the epidemic approaching its end. What is the reason for this? The populations are very similar, all having a relative degree of socio-economic disadvantage. There is no suspicion of dietary difference, although in general diet appears to be of little or no importance in consideration of CHD death rates. 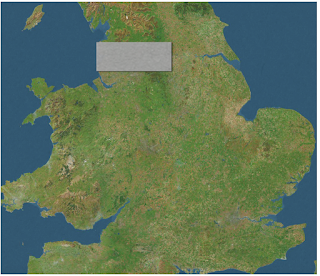 The maximum elevation is Burnley at 105 metres above sea level. The four towns lie on the same latitude, 53.8 degrees north of the equator. 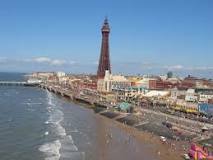 Blackpool is on the coast and it has been the traditional holiday destination for the populations of the three industrial times. Could differential exposure to the sun be the solution to the varying CHD death rates of the four towns? The answer is “Yes”. The reason for the sunshine variation is based on the location of the coast of Lancashire on the Irish Sea, with a prevailing wind off the sea. It is fed by the Gulf Stream, and so the sea is relatively warm (considering its latitude) and the air immediately above the sea is moist. At an altitude of only 500 metres the air is cool, in keeping with the proximity to the Arctic. As the air from the coast reaches the hills close to Blackburn and Burnley (particularly Pendle Hill (557m, 1827 ft) cloud forms and sunshine is reduced. The photograph is looking north, on a day that Blackpool, on the coast, left of the image, would have a clear blue sky, as in Figure 1. 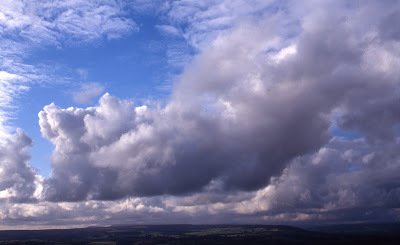 It can be seen that the hills generate cloud cover that reduces sun exposure of the populations of Blackburn and Burnley. 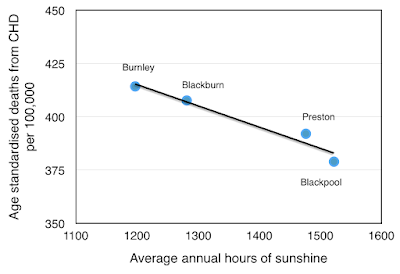 If we plot CHD death rates against hours of sunshine we find an excellent data fit: the greater the annual sunshine received by the four towns, the lower is the mortality rate from CHD. Once again we see the same pattern: increasing exposure to the sun appears to give some protection against CHD death. 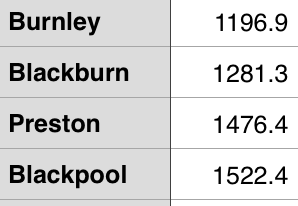 We see this not just in these four Lancashire towns, but also three other Lancashire towns at different altitudes; in cities at different altitudes in the USA; in towns at various latitudes within England and within the UK generally; in cities at various latitudes within France, and within Europe overall. I have previously indicated that CHD has been a 20th century pandemic occurring in all continents simultaneously, with the exception of the tropics. It arose in the 1920s, reached a peak in about 1970, and thereafter underwent a dramatic and spontaneous decline by the end of the 20th century. The only realistic explanation is that it has been due to a micro-organism, the precise identification of which is not clear. The protection given to certain populations by the sun is therefore likely to be mediated by maximal immunological competence. It is known that the sun has this effect, demonstrated in its well-established relationship to tuberculosis. Also it is known that damage to immune mechanisms will increase susceptibility to CHD. There is also laboratory evidence of the immune / inflammatory cascade being enhanced by vitamin D through vitamin D receptors. More of this will follow in subsequent Blog Posts. The sun has many benefits. Bone health is well-known. Immune competence is not so well known but it is of great importance. Randomized Control Trial Assessing Impact of Increased Sunlight Exposure versus Vitamin D Supplementation on Lipid Profile in Indian Vitamin D Deficient Men. Patwardhan VG, Mughal ZM, Padidela R, Chiplonkar SA, Khadilkar VV, Khadilkar AV. Indian J Endocrinol Metab. 2017 May-Jun;21(3):393-398. Would be interested in comments. That was very interesting! Thank you for sharing it. I will be sharing it with my husband who insists taking supplemental Vit D is just as good as getting sunlight, as long as his blood level of Vit D is in normal range. He never allows himself any sun exposure because of worries about skin cancer. I tend to feel moderate sun exposure is beneficial. Like almost everything else - not too much, but not too little either. Hi Nankie - a Post not yet completed will tell you that people with non-melanoma skin cancer have a long life with with good internal health – a measure of sun exposure. Non-melanoma skin cancers are easily dealt with. Their significance is dwarfed but the benefits of the sun.